Mobile growth is surging ahead like never before, according to our annual reader survey. Find out what your peers are saying, and where their IT budgets are going. There's good news for gadget geeks! We all know that mobile growth is on the rise via our checkbooks and personal iTunes accounts. TechTarget's annual SearchMobileComputing.com reader survey also found that IT departments are supporting mobile growth in both devices and applications like never before. Nearly 57% of our survey respondents reported increased mobile budgets, year over year. This is a significant jump, especially considering that mobile spending was one of the few line items that remained strong during the recession. Topping off the overall mobile shopping list were tablet PCs, smartphones and mobile security products. When it came to software solutions, users planned to spend the most on mobile business applications such as CRM, ERP and accounting applications, followed by security solutions and mobile management software. It was evident from reader responses that the mobile environment is more complex than ever —77% work in an organization that supports multiple brands and types of mobile devices on the corporate network, and 58% have added support for a wider range of devices in the last year. At the same time, IT is gaining control over devices. A full two-thirds of respondents said they have formal mobile security policies in place for mobile device loss or theft, and 59% have created formal policies regarding data ownership and the ability to wipe corporate data from employee-owned devices. Why are mobile devices proliferating so quickly? "Productivity" appears to be the magic word. 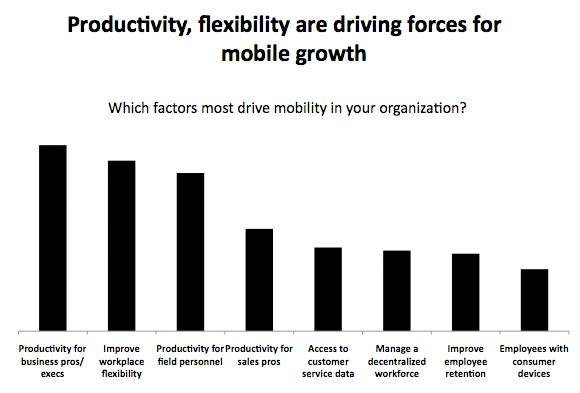 When asked to choose the biggest drivers for mobile growth and investment in their companies, readers cited productivity among many groups of users—including business executives, field personnel and sales professionals—in their top choices. Workplace flexibility was also a major factor. The business applications on a device, of course, are what make it valuable for a user and create the productivity and flexibility benefits. Survey respondents overwhelmingly reported that email was the most common corporate mobile application, with 85% having already deployed the capability. Reader Damian Locke, system administrator at Scientific Systems Company, a defense engineering firm in Woburn, Mass., explained that email is his only corporate application and he doesn't think that will change, although he does "expect continued growth in smartphone use for corporate email access." David Barrick, vice president of IT strategy and business alignment at BB&T Corp., a financial holding company in Charlotte, N.C., also vouched for the importance of communications applications. "The most important [application] for internal users currently is their PIM [personal information management] info -- calendar, mail, contacts, corporate directory." He added that his organization is now expanding into more sophisticated database-driven applications. "The most requested applications that we are working on now are CRM access and BI data access," he said. Our survey respondents, in general, were even more ambitious in their plans for rolling out future mobile applications. They predicted that in the next 24 months, they would be most likely to implement individual collaborative applications (such as instant messaging, SharePoint or workflow apps) at 26%, full-fledged unified communications at 24%, virtual desktop integration at 22% and video conferencing at 21%. Although applications have become the raison d'être in the mobile debate, the importance of the hardware and operating system (OS) platform cannot be denied. 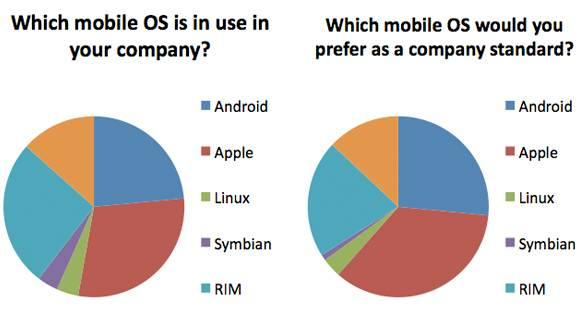 Research in Motion (RIM) held the smartphone market with our readers, hanging onto 62% of our surveyed audience. Not very far behind, however, was Apple, at 51%. Motorola and Verizon both came in with about 25% of our readers' smartphone deployments. Users who said they were considering switching primary mobile device vendors cited the biggest factor affecting their decision to switch as device operating system, at 56%. Far behind was the promise of better support services, at 38%. Barrick noted that his organization began as a BlackBerry shop and has BlackBerry infrastructure. But since it decided to be a "user choice shop" and support other platforms like iOS, there has been some migration away from BlackBerry. He expects that trend to continue when Android is approved by his team as well. This dynamic was echoed by overall survey results. Despite RIM's lead in smartphone deployments, the BlackBerry maker appears to be rapidly losing ground as it struggles to keep pace with the functionality and sheer number of apps supported by Apple and Android. When asked what they would pick if they were to standardize on a device manufacturer, 62% of readers said they would choose Apple while only 37% said they would pick RIM. And while BlackBerry led our survey results in smartphones, when asked about mobile devices in general, 67% reported use of Apple's iOS, 60% use RIM's BlackBerry/QNX and 54% use Android. Anthony Allen, systems administrator at Doron Precision Systems Inc., a maker of driving simulation systems in Binghamton, N.Y., explained his company's outlook. "We are evaluating the switch to either Apple or possibly even the Android platform. I feel either solution will give us better capabilities over RIM offerings." About the survey: TechTarget Networking's annual survey of SearchMobileComputing.com members was completed in May 2011. More than 360 IT professionals completed the survey. They hailed most commonly from the verticals of manufacturing, government, finance, education and healthcare. Twenty five percent of respondents identified themselves as mid-level IT managers; 12% as network architects, engineers or administrators; 12% as security managers or administrators; 11% as senior IT managers; and 9% as business executives, managers or staff.